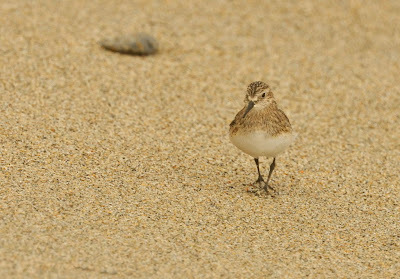 Long Rock beach is busy with migrant waders and this Baird's Sandpiper was found among them on Thursday evening by Mark Warren. 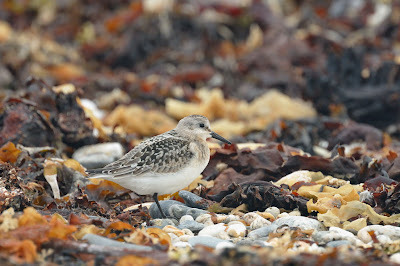 Baird's is just about an annual vagrant in Cornwall - from memory tonight whilst posting this blog, I have seen at least four along this exact stretch of beach! 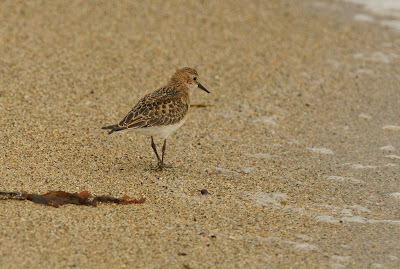 Baird's seem to like feeding in the seaweed and on the beach. 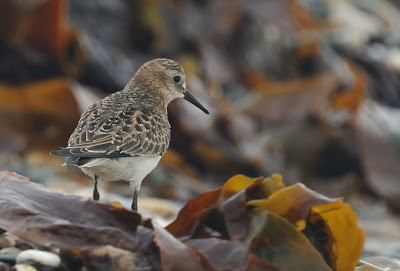 From the photo's shown, the upperparts look quite worn and abraded and don't have the uniform scaly pattern that juveniles normally show; it can be aged though as first year bird by the white tips to the primaries. Adults would show all black primaries. 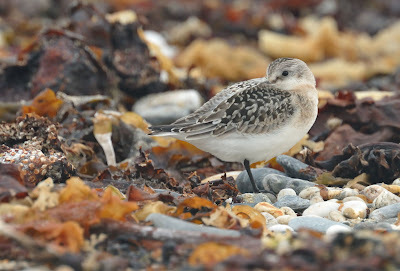 There are approx 30 records of Baird's in Cornwall, most of which occurred in September. 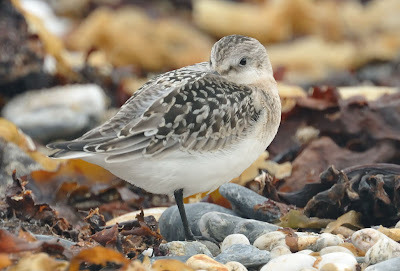 These juv Sanderling shots were also taken tonight in fairly dull light whilst waiting for the Baird's to show again. EXIF detail: RAW file. Aperture F/7.1 Exposure -0.3 EV to 0.0 EV. ISO 400 to 640. WB Cloudy. Focal length 840mm. 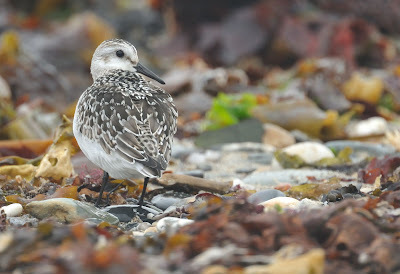 All images sharpened and cropped in Capture NX2 software. Colour unchanged. Lovely Images Steve,these shots are tops. 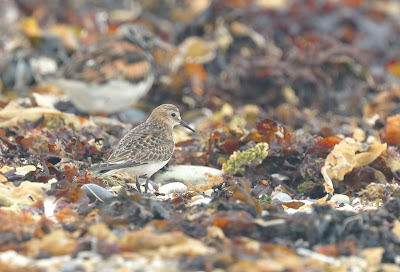 Good shots of the Bairds, in an interesting plumage as you've said. Thanks David for the comment. I have since spoken to Mashuq Ahmad just to run this bird's plumage past him. 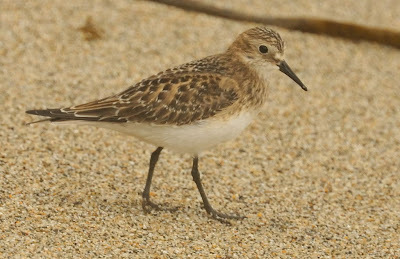 He also commented that an adult would have all black primaries and the general plumage would be a lot greyer, rather than scaly brown. 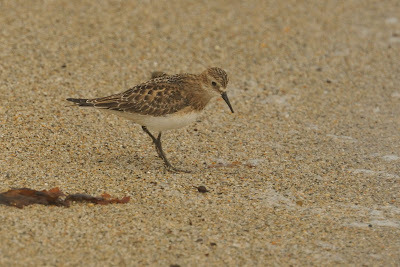 The juv bird in question still looks quite scaly at different angles. Steve.